It’s been almost half a century since email emerged, period during which it took over all type of communications inside (and outside) organizations. And it took Slack less than 1 year to break down businesses’ addiction to this tool. Over 365,000 people already decided to trust Slack with their internal communication and put an end to the inbox overload, leaving place to productivity – the future of work asks for effective collaboration, via simpler, more adequate tools. 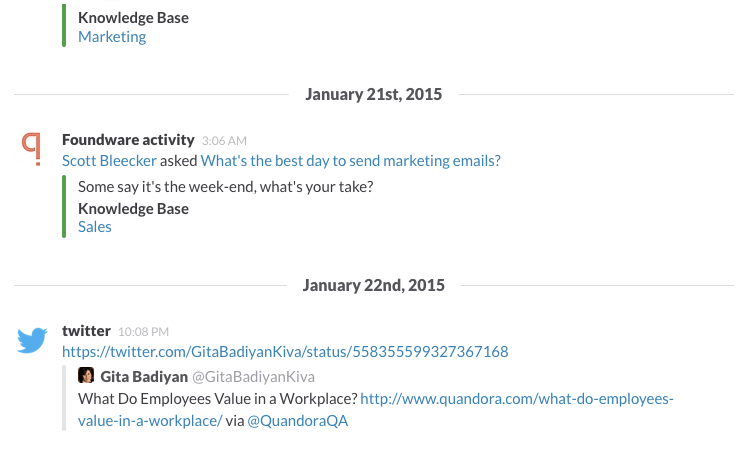 We’ve been using Slack for few months, but just as every other “slacker” out there, we loved it since day 1. And since our missions share a common goal (we aim at improving knowledge sharing and take it out of email, very much like Slack aims to get notifications and internal communication out of email) and because some of our customers also started using Slack, integration was imminent. In case you are not familiar with our product yet, Quandora is a Q&A platform that provides a great way to ask questions and build knowledge with your co-workers, enabling simple, efficient knowledge sharing with your team. It takes seconds to create a domain and test it for free for 30 days. At this moment we are in the process of getting Quandora listed in Slack’s marketplace, but until the procedure is complete, you can enjoy the integration through Slack’s Incoming WebHook service. This shouldn’t take longer than 5 minutes, customization steps included. Scroll down to Integration Settings (recommended so that users don’t get confused about the source of the notifications) > Customize Name + Customize Icon (here’s a link to our logo for this purpose). Copy the Webhook URL and paste it in Quandora (Manage Domain > Activity Sharing). How to: go to Manage Domain > Activity Sharing > enable Slack and add the WebHook URL (Slack will provide you with the webhook URL, I’m explaining how to get it in the last paragraph of my email). Note: for now, the default channel Quandora will post to is the #general one. We’ll change that soon, so you will be able to specify the default channel starting with this step. (Update: You can change at any point the channel you’d like your activity to be sent to from Slack’s Incoming WebHooks page). How to: go to Manage Domain > Knowledge Bases > select knowledge base > Activity Sharing tab > type in the Slack channel you’d like to send your Quandora KB activity. How to: go to Manage Domain > Access Policy > Authentication Services > turn Slack login ON. Note: the integration also supports user provisioning from Slack (if the users don’t exist, they are provisioned from Slack with on the fly after authentication). That’s it, now you’re good to go. We’d be happy to hear about your feedback on this integration and ideas on how to improve it, so please feel free to send all your questions and comments should you test it.